We’re not wheat intolerant when it comes to shoes. In fact we’re more than tolerant — we embrace shoes that look like Timbs with open arms. Things definitely done changed — a short while ago, we would have spotted this shoe and staked it out until it hit the sales. Now, it’s a hype. Nobody cared about the Air Force 1 Mid — we Euro heads might have an affinity because after its 1994-era introduction, they seemed to be one of the few Uptown silhouettes that were easily attainable on these shores. Those wheat, white midsoles, double-layered swoosh waterproof Mids from 2003 were superb, but the one that set it off was the 2001 co.jp Low joint with the gummy midsole in 2001. It seems obvious now, but who was combining two parts of the east coast’s street-level uniform like that before? Prior to this, it was AF1s in the summer and Timbs in the winter — this seemed all seasons, until we wore pairs and realised that they were pretty easy to destroy. We liked the parallels between the fruitless quest to keep white Forces fresh and the war against workbook scuffs that can’t be won, but when it looked that beautiful, we weren’t mad. Shouts to the Barcodes and 2005 wheat Lows too. 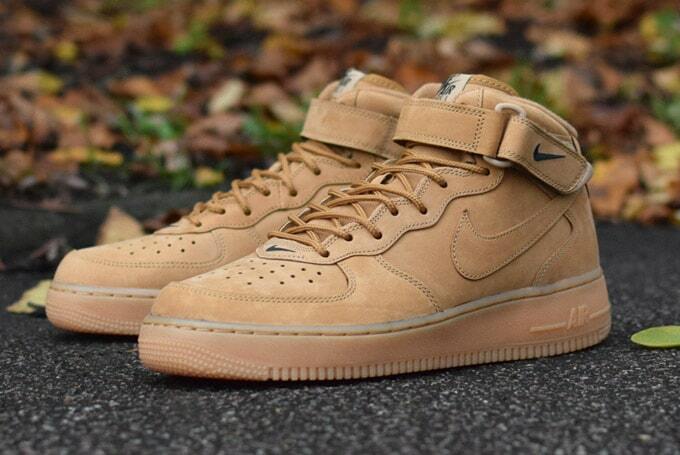 When they’ve got that mini-swoosh on ’em, Mids bring back a lot of memories for us and these go full gum on the sole unit and total nubuck on the upper — the ‘Flax’ name given to these Quickstrikes smartly circumvents the wheat name by harvesting something similar (some people say that it’s the new wheat). Bar some occasional glue overspill, the quality’s not bad at all. These don’t even come close to 2007’s Bobbito Garcia Timberland tributes using the Hi shape (and despite Vac Tech being pretty mehhh, the AF1s from that wheat collection were pretty good)— but, in fairness, very few shoes ever could — yet they definitely seem to capture the spirit of the times. Given A$AP Mob’s patronage of the once loathed halfway shape in white on white and the enduring popularity of style number #10061, Nike are riding the zeitgeist with these. The ‘Flax’ Nike AF1 Mid QS will be online this Saturday.